Kevin Pietersen's fifth one-day century inspired England to an epic one-wicket victory with one ball remaining against West Indies in Brian Lara's final game. In pursuit of 301, Pietersen reached 100 with a six, but when he fell next ball, 32 were still needed. Paul Nixon hit four fours in 38 but was out with three runs required, leaving Stuart Broad to hit the winning blow. Earlier Chris Gayle smashed three sixes in a dazzling 79 but to the crowd's dismay Lara was run out for 18. On a day of high emotion as Duncan Fletcher bowed out as England coach, Michael Vaughan, who had earlier taken 3-39 with the ball, hit six fours and two sixes to get England into a good position. But after he was run out for 79, they lost Paul Collingwood, Andrew Flintoff and Jamie Dalrymple in quick succession to leave Pietersen much to do. In partnership with the combative Nixon, however, Pietersen reduced the equation to 54 from the final 36 balls. The showman moved into the 90s with a boundary and reached three figures with a memorable swipe over mid-wicket off Jerome Taylor for six, but attempting to repeat the stroke to the next delivery he lost his leg-stump. Nixon hit three fours in four balls and took England within three runs but fell to a slower ball from Dwayne Bravo as the Windies scented victory, but 20-year-old Broad, on his World Cup debut, had the final say. Given that his side struggled to post a total against South Africa, Vaughan opted to field first when he won the toss for the sixth time in succession. Gayle had failed to make a half-century in eight previous matches in the tournament. But the pace and bounce in the wicket proved ideal for his flowing blade and 22 came in one over from Liam Plunkett. There were some blistering shots to delight the crowd, including one bouncer he deftly cut to the boundary. One savage straight drive might well have decapitated a less nimble umpire than Simon Taufel. England took the second powerplay after 22 overs, boldly recalling the erratic James Anderson, who might have had a wicket if Plunkett had reached Gayle's thick edge diving forward at third man. But in the next over from Flintoff, Gayle was caught, smartly taken in similar fashion by the alert Broad, to end an opening stand of 131 and bring Lara out to a tumultuous reception. Smith fell to one of the great catches, Paul Collingwood thrusting out his right hand at full stretch, but after a fluent drive off the back foot and a deft leg glance there was the dismissal that the vast majority of those present did not want. Lara set off for a run but Marlon Samuels sent him back and Pietersen swooped at mid-on, leaving the legendary left-hander in mid-pitch. After Lara saluted the crowd the atmosphere changed completely, as if someone had turned a volume switch off, but instead of crumbling under the gravity of the situation, Samuels became inspired. Plunkett disappeared for 24 in another over as Samuels began to atone for his grievous blunder. 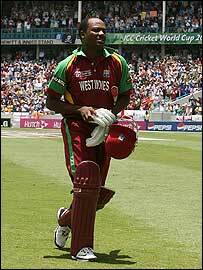 He recorded the fifty partnership with Chanderpaul from only 27 balls. One shot matched Gayle's for ingenuity, clipping a leg-side full toss from Flintoff between his pads to the square-leg boundary. The announcement of his fifty from 37 balls was cheered enthusiastically by the crowd to show there was no lasting animosity towards Samuels, a player they hope will be a new hero in the post-Lara era.